Life continues to roll by at a turtles pace, the pace of a turtle who is clinging to the back of a cape buffalo as it stampedes recklessly onwards across the African savannah with never ending zeal. Several weeks ago Karen and I packed up our children, and 2 weeks after moving from 3 Hills to Rycroft we made the drive right back down to that area. We weren't able to get back to 3 Hills itself, but attended a Neufeld family reunion at a camp just west of Olds. For those of you wondering why we would be attending a Neufeld reunion, my Grandma Derksen was born a Neufeld. It's legit. Although there was a lot of driving in a very short time span (which leads to tired kids and tired parents), we were able to see several people there whom we had not been able to connect with prior to that weekend. It was also a lot of fun to be able to talk and visit with a lot of family whom we will probably not see again for many years. I also tanned my face a rosy sunburned reddish colour. The end results of that actually turned out quite nice after all of the new skin grew back in. The following week was a good one for our family. We are largely settled back into our home here in Rycroft, and we were able to kind of get our groove back during that week. We were able to begin making contact with people who as of yet have gone un-contacted and I also began the process of getting in touch with a few more of the churches in the area to find out if we can speak there some time this summer. With all of the packing and moving and unpacking and cleaning and... stuff that has gone on in the past month it was great to begin to feel the normalcy of ministry partnership work again. Friday morning signaled the first time in our support raising process that I have left Karen and the kids alone for the weekend and I drove up to the booming metropolis of Boyle, AB to spend some time with a bunch of men from Ft McMurray who were down for a men's retreat. After getting to Boyle, I made a phone call and headed back to Athabasca, where I should have stopped when I drove on through some time before. I had driven through rain for most of the day and rain was forecast for the remainder of the weekend also. This was to make the weekend a little bit interesting, but in kind of a challenging and fun sort of way. We were to be camping and I had borrowed my son's tent, as our family tent is much to palatial for one person. 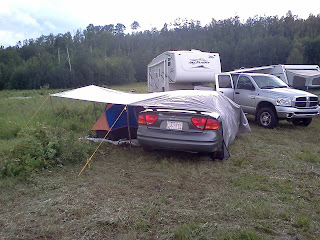 I had also, as any good Albertan camper would, brought along a couple of tarps which I planned to hang off of trees to protect my tent from the rain and give myself a dry-ish area. Problem 1: Due to the rain we were not able to drive up into the bush where we has been planning on camping. Problem 2: Our new location was a little bit short of trees. There were none. Problem 3: My tent doesn't have a great fly for shedding rain. My solution to these problems is pictured here on the right. I'm the one under the tarp in the tent, not the one in the 5th wheel trailer. It worked wonderfully well and I was also able to get from my tent into the car without getting wet. Good times. As a bonus it also kept Mom & Dad's car out of the rain (kind of). The purpose of the weekend was twofold. First, to meet some new friends and spend some time sharing about MAF with them and interacting with other men as a fellow man (insert man grunt here, a-la Tim Taylor). Secondly, to shoot all of them repeatedly with paint fired at high speed from a pneumatically powered gun and be shot at in return. Oh yeah! Mission accomplished. Even though the rain persisted through the night and also through much of Saturday, we were able to visit, eat, make a large "man sized" fire, pick up and move the fire after we made it, and take time getting to know each other better. Although our feet were thoroughly soaked after one round of paintball on Saturday morning, 18 rounds later we were all totally soaked and still grinning like schoolboys. Schoolboys who are exhausted and who can hardly move from tiredness as well as the pain of welts all over our bodies. Oh yeah! This morning I was still finding new bruises that are just now making their way to the surface of the skin. What a great weekend! A highlight was also doing a fundraising run with my buddy Dave. Many of the guys paid a premium price per paintball to have free shots at us as we ran unarmed in front of them. A big thank you to all who participated. It's one of the most creative (and painful) things I've yet done to raise support. Thanks also to Dave for all of the work and effort that you have gone to on our behalf. On a different note, if you look to the side at our fundraising thermometers you will see that our monthly support continues to rise. Thank you so much to everyone who has played a part in our journey so far. When people come up to us and say things like, "I pray for you every day." or we get notice that someone new has begun to support us financially, it blesses our socks right off. We pray that each of you will also be blessed in return as you partner in the Lord`s work through MAF and many other missions and churches all over the world.